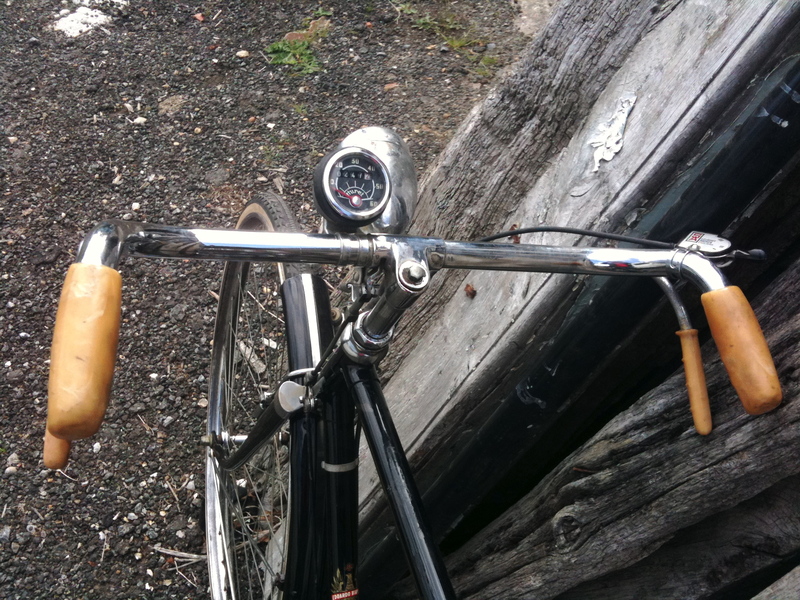 A 1950s Bianchi is a rare item in Britain. I found this one in France in early 2009, though it took over 6 months before it made its way across the Channel to me, via a network of French friends. During its journey, my friend Patrick received it. He can not resist restoring a vintage bicycle, so he sorted it out mechanically for me and added sparkle to the paintwork and bright bits. It has interesting piston-operated brakes. Like Henry Ford, Edoardo Bianchi was the grandfather of the modern bicycle. His innovations coupled with the success of Bianchi’s “Reparto Corse” makes Bianchi one of the most influential manufacturers in the history of cycling. On Milan’s Via Nirone 7, a 21 year old Edoardo Bianchi started his first shop in 1885 repairing bicycles, which were, at that time, a recent invention. Bianchi was quite a visionary because within three years, the company introduced one of the first safety bikes (below), as well as the world’s first bicycle with pneumatic tires. Within ten years of Bianchi’s inception, the company was officially recognized by building a bike for Italian royalty, Queen Margherita. Her majesty made eating pizza an international phenomenon, and the endorsement of Bianchi by Margherita’s “Royal Crown” had an undeniable impact on Edoardo’s business. Reparto Corse, which translated means “race department”, was yet another creation of Bianchi in the late 19th Century. In today’s world of Italian automotive, motorcycle, and bicycle racing, Reparto Corse is a universal term which represents the utmost in technology innovation for the purpose of winning. Bianchi first put this concept to work in 1896 by racing their bicycles in order to establish a proving ground for their technology. By 1899, a Bianchi ridden by Giovanni Tommaselli rolled to victory in the Grand Prix of Paris, the predecessor to the Tour De France. The notoriety Bianchi was receiving from its Reparto Corse made the company one of the most popular brands in its industry. Growth was exponential during the early 20th Century as Bianchi became the choice in competitive bicycle racing. As Bianchi was growing into the preeminent manufacturer of high performance bicycles, World War I interrupted its track of accelerating its bike business. Because of Bianchi’s size and influence, the Italian government mandated that Bianchi focus its efforts on manufacturing in support of the war. By this point, Bianchi had become more than just a bike manufacturer. According to Bianchi, by 1914, the company was producing 45,000 bicycles, 1,500 motorcycles, and even 1,000 cars per year. Therefore, it was clear to see why the Italian government required Bianchi’s assistance. The most notable invention that came from the period of WWI manufacturing was the birth of the “bersaglieri”, the very first mountain bike. Long before Joe Breeze, Tom Ritchey, and Gary Fisher bombed the downhills of Mount Tamalpias in Marin, Bianchi had developed a bicycle for the Italian army which featured front and rear spring suspension, telescoping seatstays, 60cm wheels with wide Pirelli tires, a frame that could break down and be carried like a backpack, and of course optional mounts for artillery. The above advert is from 1930. After a relatively successful 1920’s and 1930’s with various Giro wins, the 1940’s was a significant decade for Bianchi. The incomparable Fausto Coppi started racing for Bianchi, the destruction of Bianchi’s manufacturing facilities in WWII bombings stopped production for three years, and the invention of Bianchi’s most recognizable trademark, the paint color “celeste”. There are several stories behind how “Bianchi blue” came about, but nobody is certain what the truthful origin of this blueish-green creation really is. Some say Edoardo created the color in honor of Queen Margherita’s beautiful eyes. Others say that it was Edoardo’s homage to Milan and its beautiful sky, or “celeste”. A third belief was that Bianchi had so much surplus green paint from Mussolini’s WWII reign, that they mixed it with blue to create a unique color. Still another story was that celeste was a complete paint mixing mistake done on the team bikes only days before the Giro d’Italia. Fausto Coppi and his teammates though the bikes were purposely painted that way for good luck, and the rest, as they say, is history. However, according to a Bianchi USA employee, Sky Yeager, none of these tales were responsible for the creation of celeste. According to her interview with Nels Cone, Edoardo created it to be a unique standout in the peloton, and over the years the color naturally developed through a few different early variations. Regardless of what the truth is, feel free to pick your favorite story and spread the legend. Fausto Coppi won five Giros d’Italia and two Tours de France with the support of Bianchi and its Reparto Corse. WWII not only interrupted Bianchi’s business, but also the career of Coppi. The “Campionissimo” won his first Giro in 1940 and set the world hour record in 1942. After a three year hiatus due to the war, he achieved his greatest accomplishments in pulling a “double” – winning both the Giro and the Tour in the same year, and he did it twice (1949 and 1952). In 1953, he won the World Championships aboard a Bianchi that had an integrated headset – an innovation many decades ahead of its time. The only racer in history with a more impressive dossier than Coppi was Eddy Merckx. Had it not been for the interruption of WWII, Coppi may well have superseded the achievements of Merckx. As if the destruction of the Bianchi facility in WWII wasn’t tragic enough, tragedy struck Bianchi on several fronts during the 1940’s and 1950’s. Edoardo died in a car accident in 1946, Fausto Coppi’s brother died in a sprint finish of the 1951 Giro del Piemonte, and in 1959 Fausto himself died from malaria at the young age of 40. Leadership in Bianchi passed to Edoardo’s son, Giuseppe, and his restructuring of the company nearly brought it to its knees. After the Italian government paid its financial debts to Bianchi, the company survived the 1950’s, and in the 1960’s Bianchi became a dedicated bicycle manufacturer, ceasing production on its cars and motorcycles. The above advert is from 1906. A few of my friends have Aquilottos, and I nearly bought one myself. The advert below is from 1952, so may be contemporary with this Bianchi bicycle.